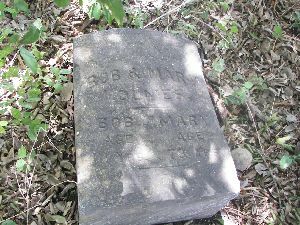 The Gatlin Cemetery is an abandoned family cemetery located just off County Road 191 and County Road 220. It is on land originally owned by L.M. Gatlin and is just across the property line from the Storm Ranch, owned (2009) by Scott Storm. It is very near Gatlin Creek in the Dripping Springs area. The community of Gatlin was named for Mr. L.M. Gatlin. He built his home on the creek and platted a family cemetery nearby. The home has been razed and the cemetery has deteriorated until only two gravesites could be recognized as burial plots (in 1994, when the site was last researched). According to Charles Haydon, who owned the land at the time, the graves were of L.M. Gatlin and his six-week old son, Seth. There are no stones to mark the graves. The Gatlin survey has been divided and (c. 1994) part belonged to Charles Haydon and a small part to Ralph Hildreth. Permission must be obtained to enter. 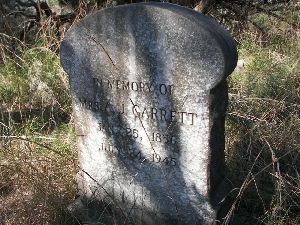 The Gatlin-Garrett Cemetery or Garrett-Gatlin as it is sometimes referred to is located on the Storm Ranch just south of Dripping Springs, off RR 12. There is a description of the cemetery in the book Clear Springs and Limestone Ledges on pages 472 and 473, the portion written by the late Maxine Storm, the 1988 reader of this cemetery. In 1971, according to the cemetery inventories listed in the Hays County Historical and Genealogical Society’s quarterly publication – Vol. 5 No. 3 (Sept. 1971) issue there were twelve more stones legible than there were in 1988. There were two Gillis stones, four Garner stones, one Harmon stone with three names on it, three Gilmore stones, and two Bryant stones. If you are searching for these family names, you may wish to look through that publication. The San Marcos Public Library and the State Genealogical Library in Austin have copies. 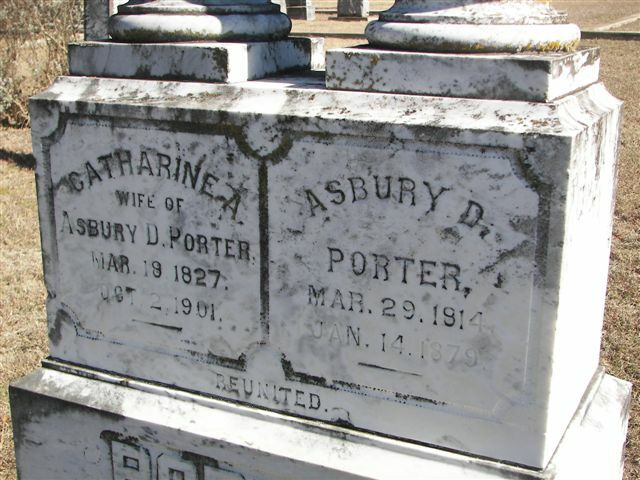 Also, in our Cemetery files we have a copy of an affidavit sworn by Dora Ardella Bryant Pickel in 1980, stating that she knew her paternal grandparents to be Steven Henry Bryant, born 1825 in Tennessee, and Martha Jane Barringer Bryant, born 1853 in Arkansas, and that the two of them are buried in the Gatlin Cemetery located on (or near) the Storm Ranch in Hays County. This would help to prove the above information found in the Hays County Historical and Genealogical Society’s publication. The history of the cemetery goes back to 1881, when W.D. 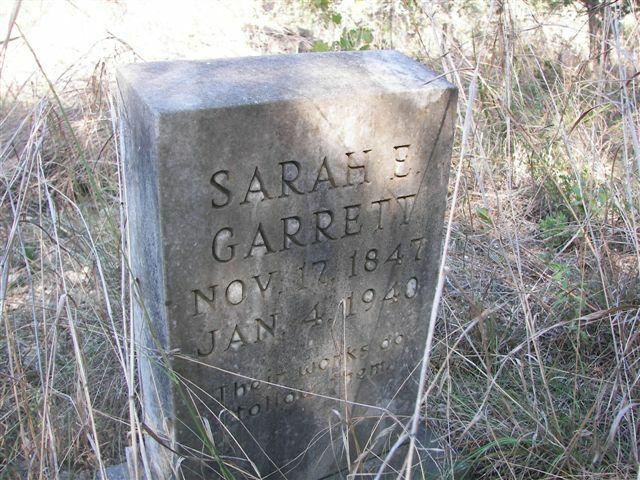 Garrett deeded to Hays County for the sum of $1 “five acres of land to be used for a church and school and burial purposes free to all, without regard to religious distinction.” The church and school have long ago been dissolved and very little of the cemetery remains. The last burial was in 1959. The cemetery is on private land and permission must be obtained before entering to visit it. 2008 Update – Gatlin-Garrett Cemetery lies just within the northern edge of the Storm Ranch property line and, while the once-deeded five acres (for school, church, and cemetery) Kerbow-Hearn mention are not evident, existing fence line does contain a little less than an acre cemetery site. The Bryant family stones mentioned in the book’s 1988-era text do, in fact, still stand. This site certainly merits a historical survey and a full re-reading. 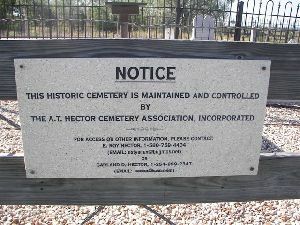 2009 Update – HCHC began a small-scale restoration at Gatlin-Garrett Cemetery in June, 2009. 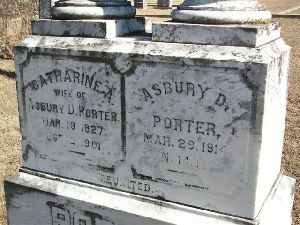 For a further description, including latest photos of the project, see Gatlin-Garrett Cemetery Restoration page. 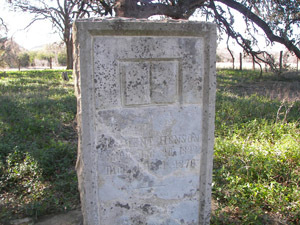 Located on land that once belonged to Isham Jones Good in the 1850's, this lone grave rests out in a pasture surrounded by a two-foot high rock wall and marked with a historical marker placed there by the Texas Historical Survey Committee, the forerunner of the Texas Historical Commission. We are grateful to Daryl Howard, whose land joins the ranch on which Mr. Good is buried, for pointing out the exact location of the grave when we visited the Christal Cemetery which is located on her property. Had it not been for her we probably would never have located the grave. 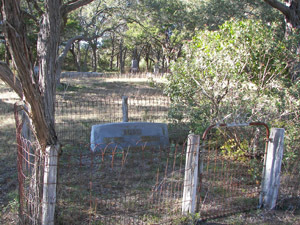 To reach the gravesite starting from the intersection of Hays County Road 150 and F.M. 1826, just north of Driftwood, take F.M. 1826 and drive toward Austin/Oak Hill for 5.8 miles to the junction of County Rd 163 and 1826. Turn left onto 163, and drive approximately three-quarters of a mile. On the left side of the road, out in the pasture, and down a sloping hillside below what appears to be the remains of an old homestead and milk house is a rock-enclosed grave. You cannot see it from the road and you will have to look very carefully close up. Hidden by cedar brush, it would not have been located had it not been for the historical marker protruding from the little rock wall fence. It is on private property and you should get permission before entering. Located on private property one mile off County Rd 314, in an area known as Hidden Valley in Wimberley, this cemetery was a family graveyard in the 1870's. During the early 1950's the field where this cemetery is located was used for a landing strip for small planes bringing visitors to Wimberley to purchase property in Ja Wahrmund's "Flite Acres" home development along the Blanco River. Gravestones have been scattered. It is a shame that this little cemetery is slowly fading into oblivion. In addition to the stones listed in the cemetery printout, there was one stone which read, "In Memory of Our Baby." It was not known for whom this stone was erected until research was done after our first printing of this book. 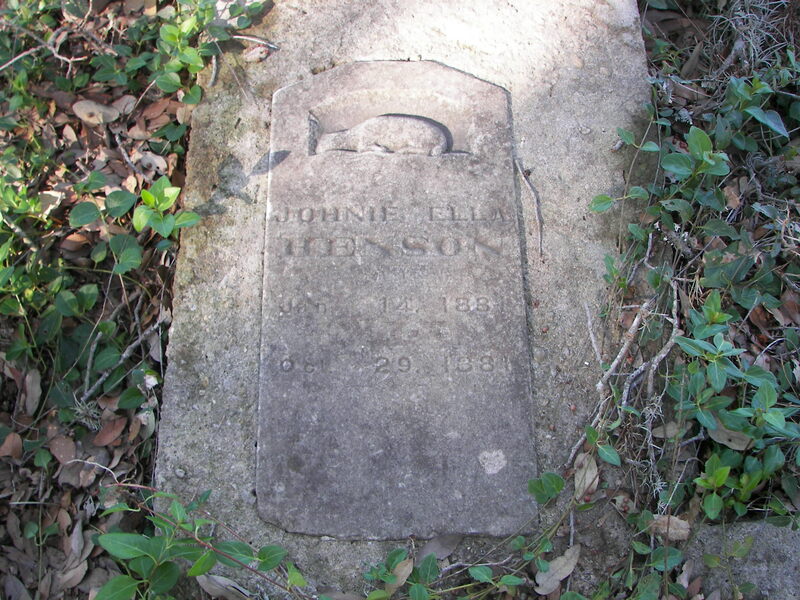 It has been determined that this is a foot-stone for infant Johnie Ella Henson. There are no dates or name on the stone. We found, in researching veterans records, two persons buried in this little cemetery -Clement Henson (1822-1876) and Albert Washington Heaton (1818-1888) are C.S.A. veterans. Their service records are not inscribed on their stones. Since our first publication of these inscriptions in 1990, Winton Porterfield has done research on a Watkins Nobles. According to Winton and to Hays County records a J.W. Nobles, age 60 on the 1860 Hays County Census was living in the household of Joseph Williamson. Also, a Watkins Nobles was listed on the 1848 Hays county tax roll. According to information related to C.W. 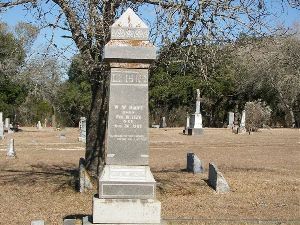 Wimberley by Louis Saunders, Watkins Nobles, a veteran of the Texas Revolution, is buried in an unmarked grave in this cemetery. A more detailed account of this soldier can be found in Dorothy Kerbow's book Wimberley, Texas, Historic Belle of the Blanco. Other unmarked graves are those of William Atwood Leath's first wife, Mary Ann. 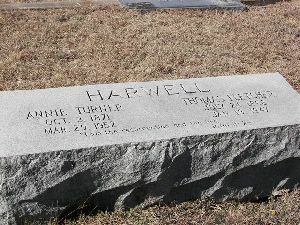 The Jane Henson, whose grave is marked, is William Atwood and Mary Ann's oldest daughter who was married to William Henson. 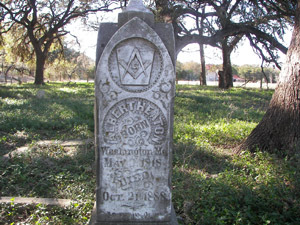 To reach this cemetery from downtown Wimberley on the Square, take R.R. 12 south for .3 mile. Turn left on R.R. 3237, and go .6 mile until you reach Flite Acres Road (County Rd 173). Turn right onto 173; then go 1.6 miles on this road until you reach County Rd 314. Turn right on 314 and cross the Blanco River. Go .3 mile farther (up the hill) to Co. Rd. 217. Turn right off 217, and travel .2 mile. Turn left off paved road onto a gravel lane. Approximately .2 mile up this lane is the entrance into Spoke Hollow Ranch. The cemetery is located .2 mile past the entrance on the left side of the road, next to the fence. You will need to look carefully as the stones are lying on the ground. There is no fence surrounding it. There are several large trees, however. There are only six stones remaining, two of them being a foot- stone and headstone for above mentioned infant. Perhaps if the ground were lightly raked, there might be others uncovered. As we go to press with this 2nd (Revised) edition, plans are underway to try to restore the stones in the cemetery and erect a fence to protect it. 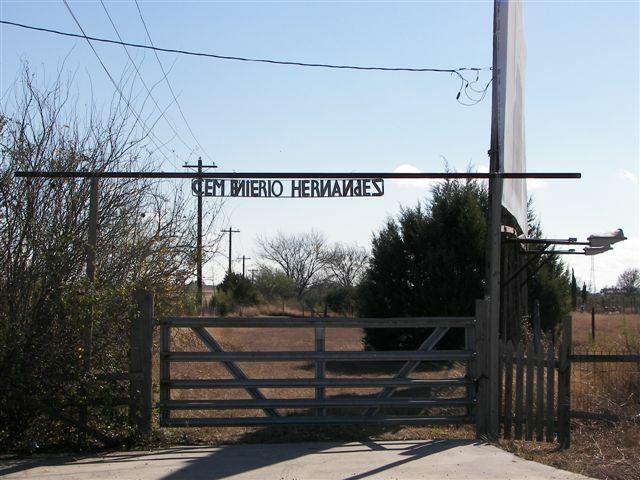 The Hector Family Cemetery is a burial site located on property that was formerly known as the Johnson Farm. But long before the land was purchased by the Johnson family, it belonged to Astyanax Troy Hector (1823-1905), son of James and Charlotte Hector who emigrated to the U.S. from Edinburgh, Scotland, in 1820. Astyanax Troy Hector was born in Virginia. 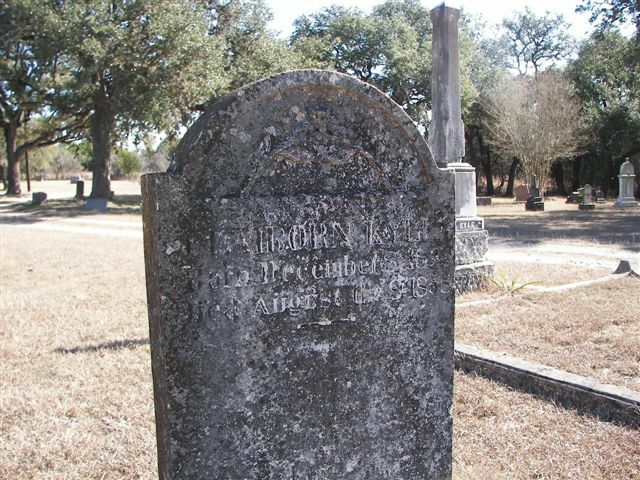 Astyanax was married first to Sarah Jane Hocker (1834-1864) of Guadalupe County, Texas, who died shortly after giving birth to their seventh child, Sarah Jane. She was buried behind the family barn, thus the beginning of the family cemetery. On returning from the Civil War, Astyanax married his first wife’s sister, Susan Nancy Hocker (1842-1886). Astyanax and his two wives (sisters Sarah and Susan) are buried in this cemetery. To reach the cemetery from San Marcos at the intersection of IH 35 and U.S. 123, go east toward Seguin on 123 for 4.1 miles. On the left of the highway is the Tom C. Johnson Farm, owned by two heirs, Chambliss (Cham) and Craig Johnson. The cemetery is located behind the family barn. It is approximately a 30’ X 60’ area fenced with a wrought iron fence, with added protection from a barbed wire fence. The headstones were all professionally restored. These improvements replaced the old fence which had in recent years been pushed over by cattle. 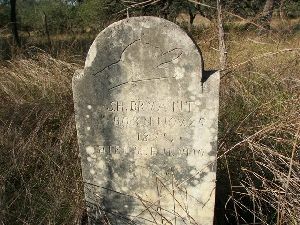 The cemetery was allowed to fall into a state of disrepair – in very sad condition, with cattle trampling over the graves and stones on a daily basis. 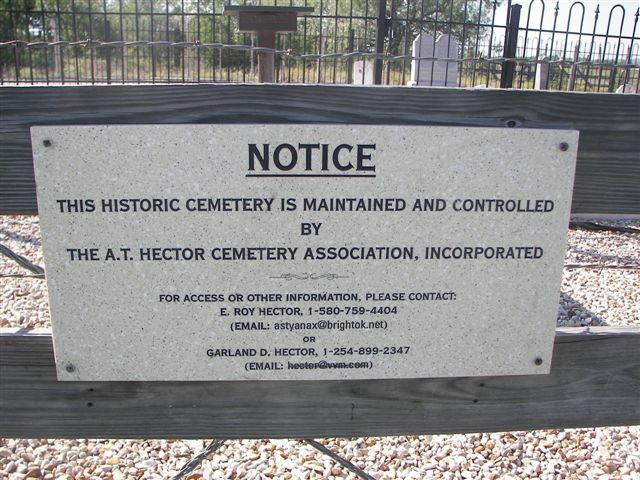 However, the cemetery has now been restored and is a source of pride and reverence for the Hector/Hocker families. The Hernandez Cemetery was created in 1974, with the burial of C.M. Hernandez. It is a private family cemetery which encompasses approximately one-half acre. It is well fenced and has a roadway leading to it from the access road along IH 35. There is a sign over the entrance gate of the roadway which identifies it as the "Hernandez Cemetery." We are grateful to Mrs. E.B. 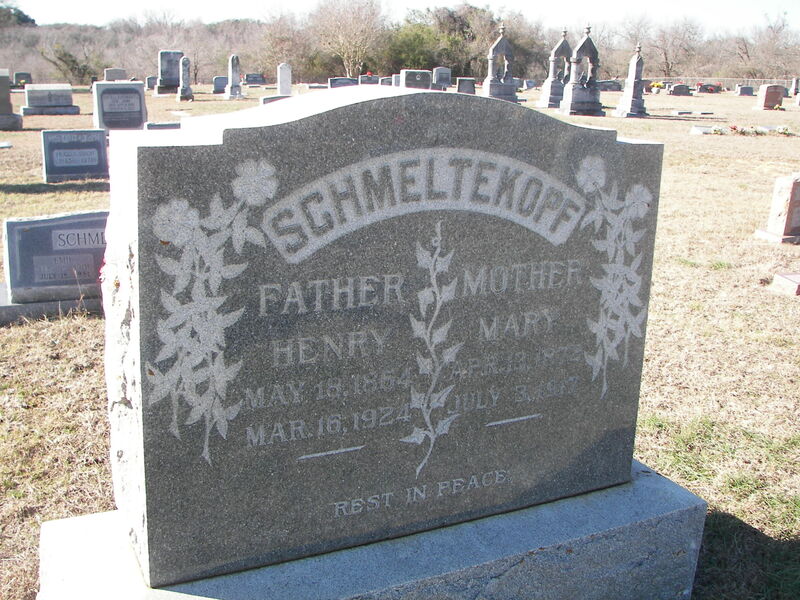 Kutscher for telling us of this cemetery, and to Mr. and Mrs. Ismael Rosales for helping copy the inscriptions. 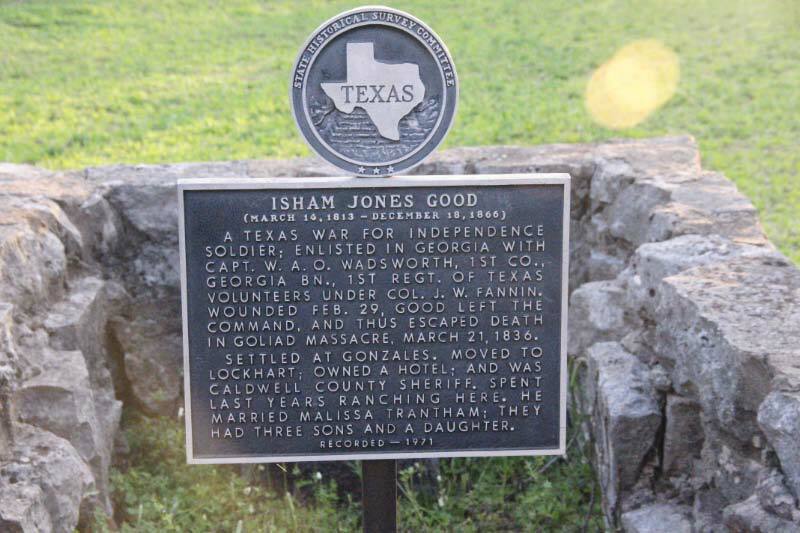 To reach this cemetery from San Marcos, take IH 35 South for approximately 5 miles from the intersection of IH 35 and U.S. 123, to Exit 199 (Posey Road Exit). Turn left and go under the overpass. Turn immediately to the right onto the access road on the east side of IH 35. Travel .3 mile. The cemetery is on the left side of the access road. For the lack of a name for this cemetery which at one time had many headstones, it is being called the Holmes Cemetery" because the one headstone remaining at this location is that of a couple named Holmes. The small cemetery is not fenced. There are cattle roaming on the site. It is located near a creek which has flooded periodically and probably accounts for a lot of the stones having disappeared because of raging floodwaters. Some stones have probably been trampled into the ground and others simply fell over have been covered with topsoil and debris. There is evidence of wooden crosses which probably had names painted on them at one time. They have almost all rotted away. The cemetery is in what could be described as deplorable condition. We were told that this cemetery served the Afro-American population of this area. The land in this area was originally settled by Afro-Americans and this is the second cemetery we found in this area to have served that race. (Nichols is the other). Both have been abandoned and are no longer used. It will be only a short time before what remains of this cemetery will disappear from the face of this earth unless some family member takes action to restore it. To reach the cemetery, take IH 35 South from San Marcos for approximately 5 miles to the intersection of Exit 199 (Posey Road). Take Posey Road (County Rd 235) and go east for 1.3 miles to the junction of County Rd 266. Turn right onto 266 and go .8 mile to the junction of Rd 265. Turn left onto 265 and go 1.9 miles. The cemetery is located off the road on the left, approximately one-quarter mile. It is under a grove of trees, where three pieces of property come together -the Henk Farm, the Guenther Farm, and the Naylor Martin Farm. There is a watershed dam nearby. You cannot see the cemetery without walking down the fence line and looking very carefully. We are grateful to Carolyn Wells, daughter of Benno Henk, who gave directions to this cemetery. Also, to Sherry Stiles, a present-day Hays County Sheriff's Department employee -who lives in the Henk rent house and who was helpful to us in locating the cemetery. Thanks also to Leonard Moeller who told us of its existence and where to go to search for it. There was, at one time, a tombstone on the Blanco River on a bluff overlooking the river marking the burial site of one individual. This lone grave was on private property owned by Hays County Gravel Company, just off IH 35, north of the city of San Marcos. The stone is no longer there and its exact location is lost to history. 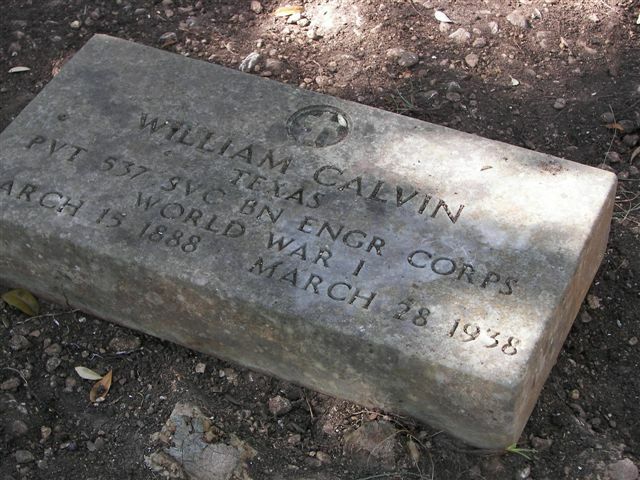 It marked the grave of Capt. W.H. Holt, who died in 1859. In the late 1960's, the lone stone was broken and in such bad condition that the birth date was illegible as well as the day of death. 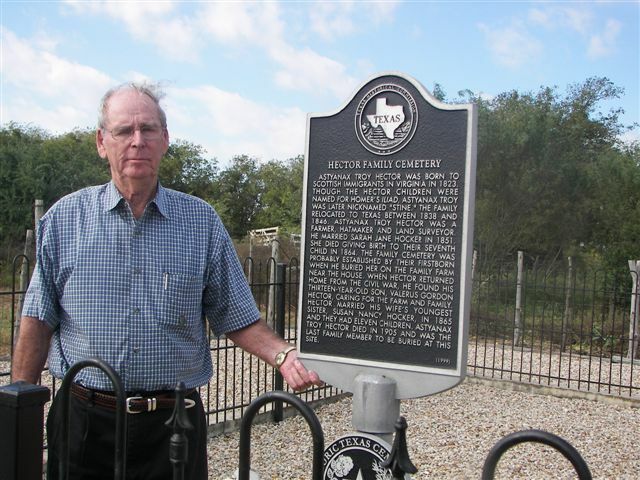 Research on Captain Holt shows that he purchased a tract of land on the Blanco River from Shad Dixon and wife on June 23, 1855 (H.C. Deed Book C, page 114). Then, a few years after his death, an Ann Holt sold the same tract of land to James Nance on August 30, 1866. 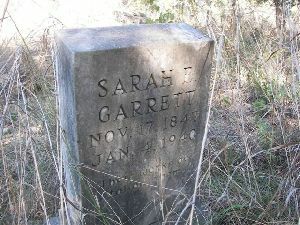 Ann Holt was not listed on the 1860 Hays County Census records nor was Captain Holt listed on the 1850 census. 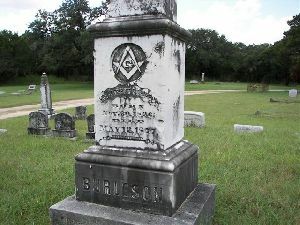 His stone did indicate that he was a Mason and anyone desiring to trace this man might be able to obtain some information from the Masonic Lodge's records. We are grateful for Tula Wyatt's having copied the information from this stone many years ago and preserving its record in several historical documents. We, also, are grateful to the new owners and managers of Hays County Gravel Company for taking the time to help us hunt for the lone gravesite, which they were unaware of existing. 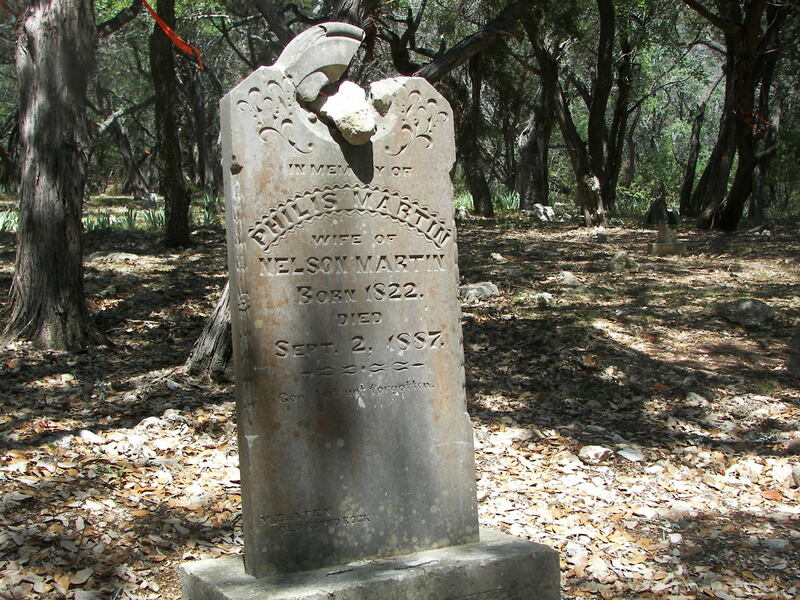 Hugo Cemetery is located on land which was an original tract of 640 acres owned by the Joseph Williamson family, who came to San Marcos from Tennessee in 1851, and settled permanently at Purgatory Springs in 1855. Approximately 30 years later the area became known as Hugo. The cemetery has served as the burial place for the Williamson and related families for nearly one hundred and fifty years. The first burial to take place in the Hugo Cemetery was that of a Mr. Shepherd. The time was during the 1840's. 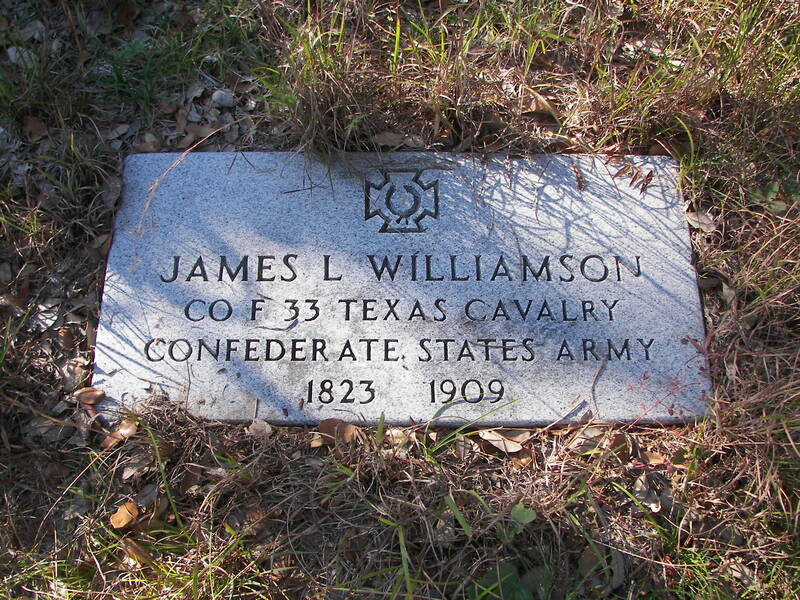 His grave is marked only by a large stone standing upright near the Joseph Williamson grave. The one-acre plot has been maintained by members of the Williamson family through the years. The hand twisted wire used for the fence surrounding the cemetery was made by them on the grounds in 1900. After WW II, brothers Elbert and Doyle Williamson, their cousin Lester Whipple, and Bonnie Adare Williamson (who paid for the fence) installed the fence which today surrounds the cemetery. Doyle and Vida Williamson, who until recently owned the land surrounding the cemetery, have maintained it ever since. We are grateful to Doyle and Vida for furnishing information about the history of this cemetery. Doyle Williamson died in 1992 and is buried in the San Marcos Cemetery. To locate the cemetery from the intersection of R.R. 12 and R.R. 32, approximately 12 miles north of San Marcos, on the road to Wimberley, continue north on R.R. 32 (toward Blanco) for 2.4 miles. Turn left onto County Rd 215 (Purgatory Road). Go approximately .4 mile. The cemetery is located on the right side of Purgatory Road on a slight rise. There is an entrance gate. You will need to drive slowly and look carefully as this is a rustic cemetery even though it is well kept. It reflects the natural beauty of the hill country. The Ireland Cemetery is a very small private burial site which holds the graves of five persons two adults and three children. It is located in a subdivided ranch now known as Bear Creek Estates on land owned by L.W. Jones. The burial lot is surrounded by an old wooden picket fence which is not only rotting away, it has almost collapsed. From time to time Mr. Jones has cleaned the site (approximately 12' x 12') of weeds. There are no tombstones identifying any of the persons buried there, but graves are very plainly marked with large rocks at the head and foot of all graves. One rock has Ireland scratched on it. Mr. Jones related to us that the brother of a Mr. George Ireland had two children buried in this small family plot. Their names are not known nor are the names of any of the deceased buried there. Both Mr. George Ireland and his brother are deceased. 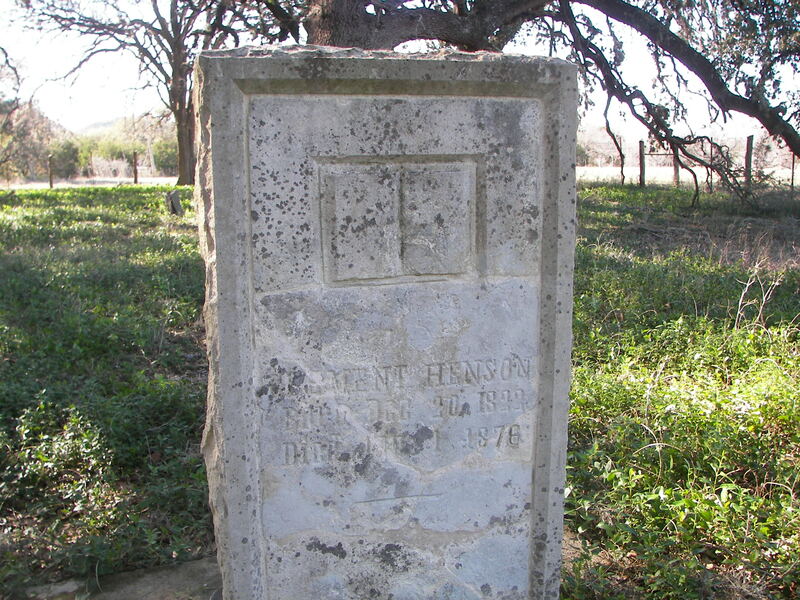 To locate this burial site, drive .7 mile north of Friendship Baptist Church on Hwy 1826, out of Driftwood, going toward Oak Hill and Austin. Friendship Baptist Church is located in the community of Friendship about five miles northeast of Driftwood. On your right will be the entrance to Bear Creek Estates. Turn into the subdivision and drive .7 mile on County Rd 367, crossing a creek. Turn right onto Crosscreek Drive. Go .1 mile crossing another bridge and driving up a hill. The burial site is located on the left side of Crosscreek Drive approximately 25- 30 feet off the road. You must look carefully to see it. We are grateful to Mr. Jones for telling us of this cemetery and to Kathy Albright for showing us its exact location. Mrs. Albright and her husband William J. are building a new home in this area. Located approximately six miles northwest of Wimberley, Jacob's Well Cemetery was thought to have been established to serve the people in that area who felt the need for a cemetery in a location not subject to flooding; however, since our first publication of these inscriptions we uncovered more history of this cemetery. 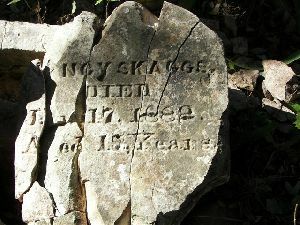 The earliest death record on a stone is that of Moses Bond Egger (11- 11-1798/1883), who, it was reported to us, was thrown from a horse on this site, broke a leg, and froze to death on a bitterly cold February night. He was found where he fell and the family buried him at that spot. According to Clemmie Egger New, the cemetery expanded around his grave. The information in our first printing that John Hons was the first grave is erroneous. This cemetery is still in use by descendants of the early day pioneers of that area. It is well kept, fenced and has its name over the entrance gate. It consists of approximately one-half acre of land, and in early years the Jacob's Well School was located nearby. 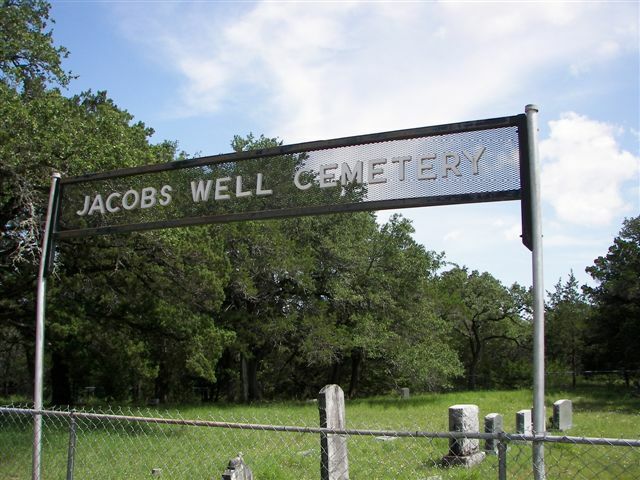 There is a Jacob's Well Cemetery Association. Also, since we first read this cemetery it has been cleaned, new stones erected to replace some of the old crumbling ones and a fence removed from around a family plot within the cemetery's confines. Some of the new stones do not contain all the information that was on the older stones; however, some stones have more information such as exact dates. 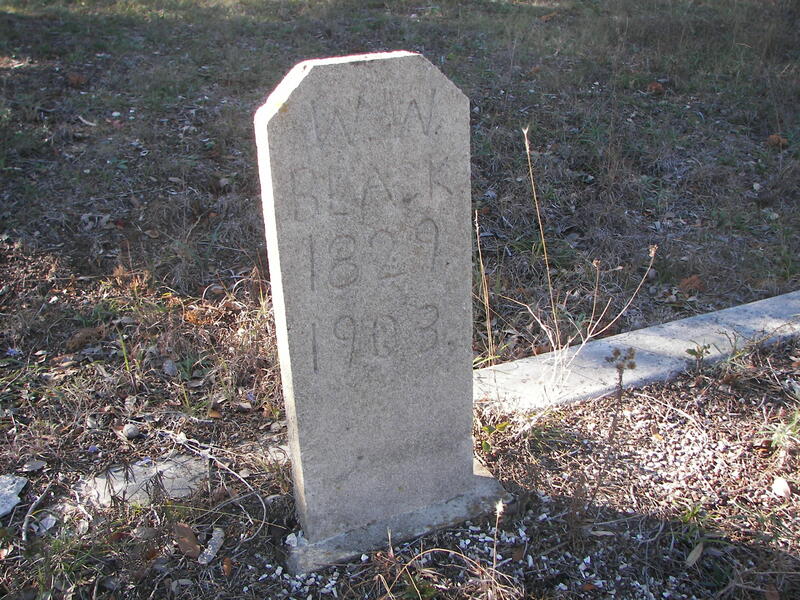 There is a story that at the death of Melinda Clem Egger (1863-1930), her husband William Henry took a cutting from her favorite rosebush and planted it on her grave. It bloomed faithfully every spring for many years. Historic Belle Of The Blanco she gives a detailed history of the Massey family, including a rather unusual account of James Foster Massey's two wives, both named Cassie, the second Cassie having been named for the first. The first Cassie is buried in the Gatlin Cemetery. Her stone is no longer there. 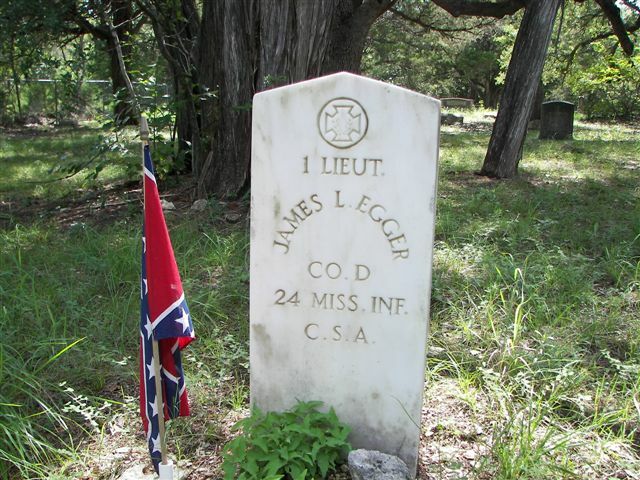 Also in the book is a history of the Egger family and more about the three Egger CSA veterans buried in this cemetery, Moses Bond Egger, Ellis Egger, and James L. Egger. To locate the cemetery, drive north on R.R. 12 from the Wimberley Square for .3 mile to FM 2325 (to Blanco). Take 2325 for 2.6 miles to junction of Hays County Rd 220. Take 220 and drive .5 mile. The cemetery is on the right side of the road. 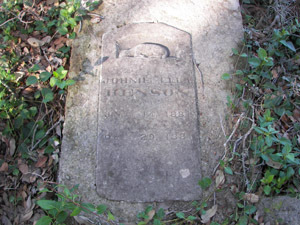 The Johnson Cemetery was a very small family plot located on property once owned by Thomas Johnson and his wife, Catherine. The Johnsons purchased the land in 1853, and built a school known as the Johnson Institute on the site. Their bodies were laid to rest very near the site of the first wooden building built to house the school. There is a detailed account of one of the Johnsons’ children, Lizzie, in the book “The Cowgirls” by Joyce Gibson Roach, published in 1990. Lizzie was the wife of Hezekiah Williams, founder of Hay City. The interesting story documents Lizzie’s eccentric life, including her demands in what may have been one of the first pre-nuptial agreements in Texas, about her cattle empire, and her trail rides to eastern markets. The Johnson Cemetery was located on the property that became the Barsana Dahm Hindu complex off Hays County Road 1826 in the 1990s. 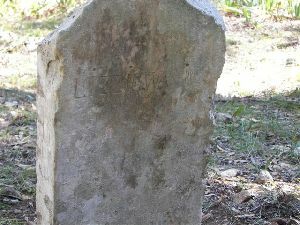 Following some controversy regarding the cemetery’s status, the Johnson remains were removed, c. 2007, re-interred, and re-marked at Wallace Mountain Cemetery. A private burial site marked only by a pile of rocks this small cemetery was established during the Civil War by a Mrs. Peter Klein when three of her children were taken ill and died within a short period of time. It has been handed down through the years that Peter Klein went off to serve in the Civil War, leaving his wife and small children alone out on the ranch, miles from civilization. When the children took ill there was no one to go for help and they were too ill to be left alone. Consequently three of them died. Mrs. Klein had to bury them by herself, and tradition has it that two of the children died within a day's time, accounting for two graves. She buried two of her children in one grave. One needs to appreciate the type of soil and the conditions you would face in trying to bury someone in this location. The topsoil is almost nil, and the ground is made up of solid rock, most of which are more readily described as boulders. This would account for the mound of rocks as opposed to rocks for headstones. She probably could not dig very deep and had to mound the rocks over the bodies . Henry, age 14; Caroline, age 12; Charles, age 8; and Frances, age 3. The latter are the children buried in this burial site. 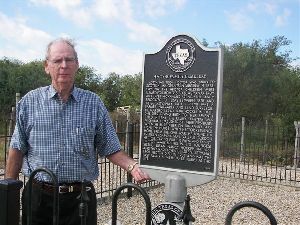 To reach this burial site, located on the Joe Rogers Ranch, take PM 967 from downtown Buda at the traffic light. Go approximately 9.8 miles to the Rogers Ranch House, which has a historical marker on its front porch. Approximately 100 yards in front of the house, next to the fence line that runs along-side Hwy 967, are the graves. You will see the rock mound. Thanks to Dorothy Schwartz and Barbara Younts for taking us to this location. The Kuykendall Cemetery is a small family burial ground located on what is now (1988) the Rutherford Ranch. It was once owned by the Kuykendall family and the Kuykendall home is still located within sight of the burial site. 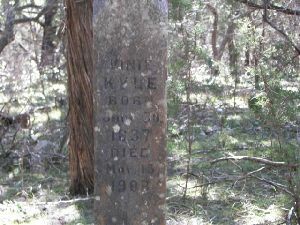 The cemetery is located atop one of the highest knolls on the ranch. 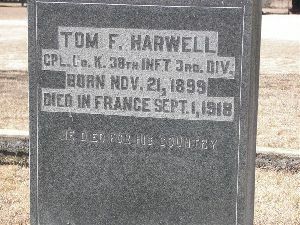 The terrain of honeycomb rock proves impossible to be dug for a burial; therefore, three of the four burials are above ground in concrete crypts, and the fourth burial is marked by a memorial stone, as this family member was cremated. The site has no fence to surround it. The concrete crypts blend in with the color of the terrain and are hard to sight if you do not pay close attention. Located on private property, you must obtain permission to visit the cemetery. 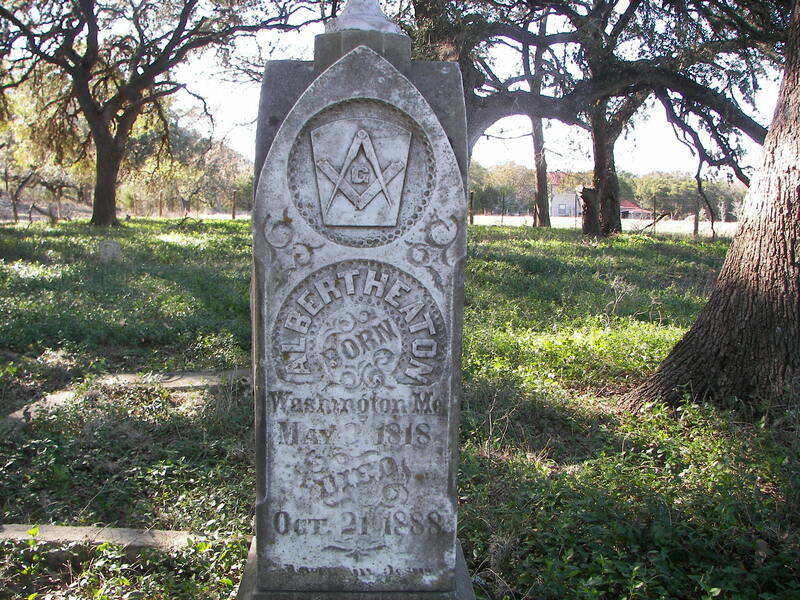 To reach the portion of the Rutherford Ranch on which this cemetery is located, take Rd 967 out of Buda toward Camp Ben McCulloch. Drive 8.3 miles. The entrance will be on the left side of the road and there will be a sign to indicate the name of the ranch. The main house is located 2.7 miles up this road. Just before you enter into the grounds of the main house, turn left and drive 2.2 miles, crossing two cattle guards. At the 2.2 mile mark the road will branch off to the right. Turn right and stop almost immediately. To your right, approximately 30 yard up on a small knoll, will be the concrete crypts. 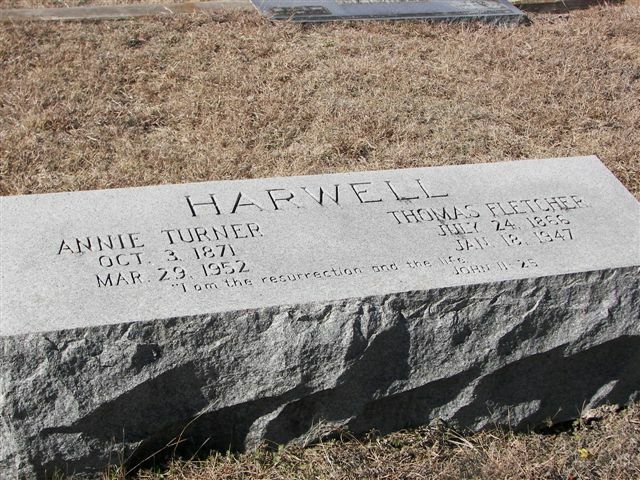 We owe special thanks to Bill Tuttle, who is a ranch foreman for the Rutherfords, for directing us to the graves and to Barbara Younts and Dorothy Swhwartz for taking us to the site. The Kyle Cemetery, located on Stage Coach Road just out of Kyle, is thought to be the oldest cemetery serving an entire community still in use in Hays County. There are one or two cemeteries which may have been established earlier; however, they are open to burial to certain families only. The Kyle Cemetery is available to anyone who wishes to purchase a burial space. The cemetery is located on land which belonged to Col. Claiborne Kyle, who donated the first fifteen acres of a land for a "community burial ground" after two burials had been conducted within the area. One of these two was his "adopted" son, Willie Parks, who died in 1849. The other burial is that of an unidentified man whom Col. Kyle's ranch hands found hanging from a very large oak tree within these same fifteen acres. This was prior to Willie Park's burial. This tree has become famous and is mentioned in several history books written about this area. It is referred to as "The Hanging Tree. " The Kyle Cemetery holds the remains of some of the earliest Hays County settlers including Major Edward Burleson, veteran of the Mexican War and probably one of the most prominent men in the history of this area. Also in the cemetery lies Colonel John Bunton, signer of the Texas Declaration of Independence, and Colonel Claiborne Kyle's son -Ferg Kyle, for whom the town of Kyle was named. An addition to the original fifteen acres of land was made sometime during the early 1900's with a gift from O.G. Parke. 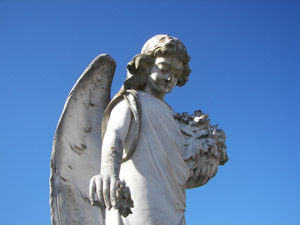 The cemetery is well kept, clean, and has a cemetery association which was formed during the 1920's. Prior to that time loving and devoted citizens of the area took care of the upkeep and records. The cemetery association is very active and has developed a perpetual care program. There are many graves which do not have markers, some known, some unknown. The association has a record of some of these burials. Because of the size of the cemetery we broke it into sections and you will need to refer to the map of this cemetery to locate a particular burial site. Our map does not coincide with the map which the association uses, so do not get the two mixed. We drew our own map while copying the stones and have more divisions, making it easier to locate the graves. Of course, if you contact a member of the association who has the records, that person can tell you exactly where a grave is located also. We are grateful to Mrs. George Vaughan who gave us information about the cemetery as well as a copy of an old newspaper. The cemetery is located approximately two and one-half miles south of Kyle on Old Stage Coach Road (Rd. 136). It is on the left side of the road when traveling from Kyle and is fenced with a chain link fence. It is identified with a sign and very easily found. 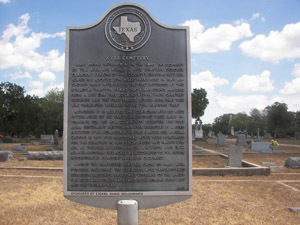 Since we first read this cemetery, a Texas Historical Marker has been dedicated and stands near the entrance. 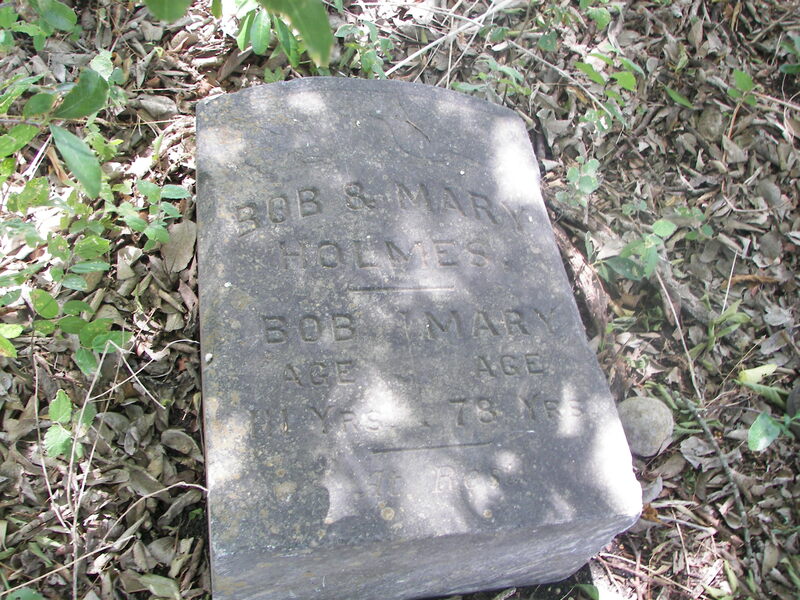 This old African-American cemetery, adjacent to Kyle Cemetery, has recently (December 2007) had an official name change though the action of the Hays County Commissioners Court and at the recommendation of longtime San Marcos researcher and genealogist Ollie Giles. Referred to for decades as the “Slave Cemetery” by the few locals who were even aware of it, the site (in 2008) in fact has no surviving tombstones indicating slavery-era deaths, though the slave-holding Claiborne Kyle family lived nearby starting in about 1849, suggesting there may have been slave burials here. When Hays County Historical Commission members Dorothy Kerbow and Jo Am Elam Hearn first searched the site (1989) on their county-wide inscription project, they found 16 tombstones, “most of which were turned over, broken, or nearly covered with debris.” They noted that death dates on several stones were early enough for their subject to have once been in slavery (the earliest date is an 1873 death of 12-year-old William Davis), but the majority of surviving stones are of later origin. Kerbow and Hearn reported the cemetery was “unkept, unfenced, overgrown with weeds and vines, and in very, very bad condition.” The long-neglected site began its “comeback” from its cedar brake obscurity partially as the result of an early 1990s reunion at the Claiborne Kyle Log House of those claiming kinship with the Kyle family. Members of those families familiar with the old burial site introduced other family members and other interested people to the site and one of the earliest sparks for uncovering the site caught on. 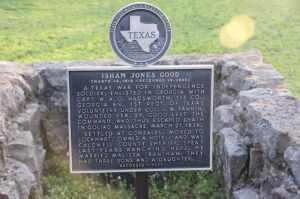 The result was a well-publicized and wide-ranging restoration project in the mid-1990s that included Kyle family slave descendants, college students, and the San Marcos chapter of the NAACP. Winton Porterfield, then chair of the HCHC cemetery committee, piloted an Adopt-a-Cemetery program and a beautiful stone entrance gate (opening from Kyle Cemetery) was built (1994). 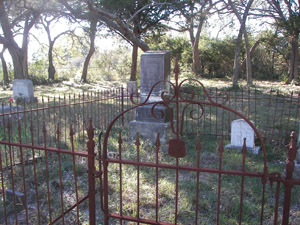 2008 update: In 2008, KYLE FAMILY PIONEER CEMETERY is one of five area cemeteries periodically maintained by terms of a Hays County Commissioners Court contract with San Marcos resident Gene Bagwell, the other contracted sites including San Pedro, Cementerio del Rio, San Marcos-Blanco, and Guadalupe Cemetery. Private work continues to research the original bounds of the site. Out of Buda toward Manchaca, on land once owned by the Lindemann family, next to a newly developed subdivision is a little cemetery that served the Hispanic ranch hands in this area. There are indications that many graves once existed in this cemetery; however, there are only a few remaining and only one person knows the identity of persons buried in them. The fence surrounding the cemetery appears to have fallen down and the post rotted years ago. This cemetery is probably one of the oldest in the area. There is one grave with concrete curbing around it; however, it has no other identification. 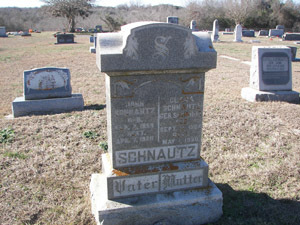 The cemetery is platted on a plat of Hays County Oaks Subdivision -Section 1, which is recorded in the Hays County Court House. There is a right-of-way leading to the cemetery; however, it is overgrown with brush and trees. You cannot drive down the right-of-way, but you can drive very close to the cemetery on the roads in the subdivision and walk to the cemetery. We know of only one family whose members are buried here. 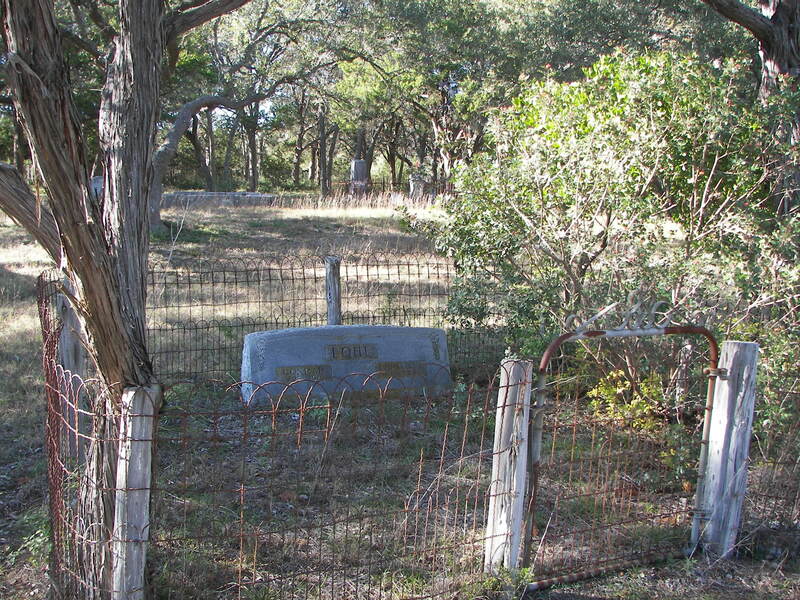 The Trevino family has a small family plot which is fenced. Ernest Trevino, a resident of the Buda area, accompanied us to the site and told us about some of his family members buried here. He was not aware of who were buried in the other graves. Members of his family buried here are: his brother, Pedro "Pete" Trevino, who died at the age of six years and is buried next t~ his mother; his brother, Arnulfo Trevino, who died in 1941, at approximately 49 years of age; and a nephew who died as an infant. All are in unmarked graves. Ernest did not think the child had been given a name. Both of Ernest's parents are buried in this family plot which he tends regularly. Their graves also do not have stones with inscriptions. 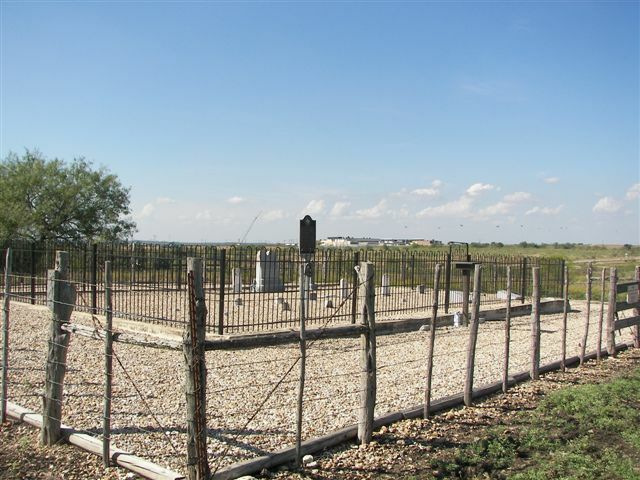 To reach this cemetery take FM Rd 967 out of Buda toward Manchaca and drive for 2.9 miles to the intersection of 967 and FM 1626. Turn right on 1626 and drive approximately one mile to the entrance of Hays County Oaks Subdivision. Turn left into the subdivision and drive .4 mile to Country Oaks Drive. Turn right on Country Oaks Drive and to 1.4 miles to Scenic Oak Trail. Go .4 mile to 16001 Scenic Oak Trail. The cemetery is located to the left of this home almost directly across from the entrance to the garage. You can park on Scenic Oak Trail and walk to the cemetery .It would be advisable to inform the owners of this home what your intentions are or you may be reported to the la\~. There have been several burglaries in this area. Perhaps you should leave a note in the window of your car, also. We are grateful to Constable Billy Reeves and to Ernest Trevino for accompanying us to this location and identifying some of the people buried in the cemetery. 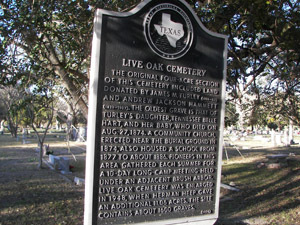 Live Oak Cemetery (Travis County) is located near Onion Creek, approximately two miles east of Manchaca, and has long been one of the principal burial sites for Hays County residents of Buda. 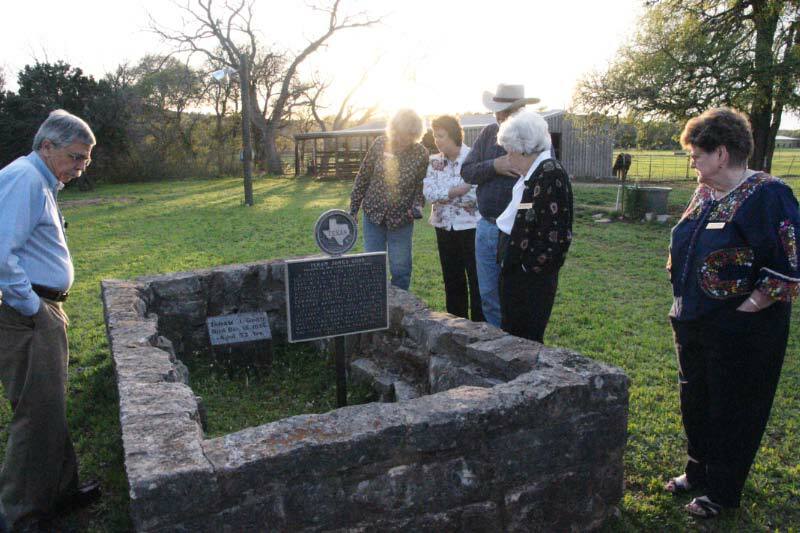 A 1994 Hays County Historical Commission publication by members Jo Ann Elam Hearn, Dorothy Wimberley Kerbow, and Barbara Younts documented the site’s history, as well as its inscriptions. We include portions of their history and incorporate information found on-line at the website of the Austin, Texas, Genealogical Society. 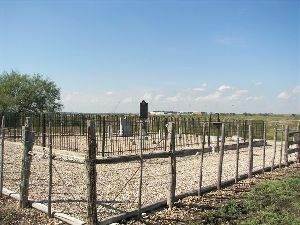 The cemetery, encompassing just over 15 acres, is well-marked and well-maintained (long a pride of caretaker Cecil Clark of Buda) and is one of the largest cemeteries in this area. It has a chain link fence and gravel roads and features large oak and cedar trees and a number of benches. 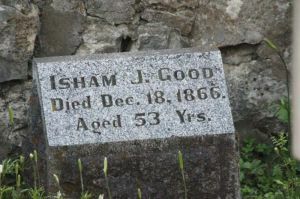 The oldest grave is dated 1874 and the cemetery remains in present-day use. 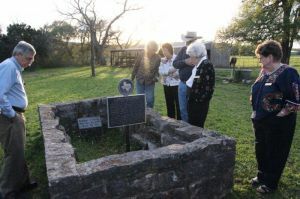 At one of the gates is a Texas Historical Commission marker, researched by the Travis County Historical Commission and sponsored by Ludie Jones Camp, documenting the site’s history. The most comprehensive history of the cemetery was done by the Hays County Historical and Genealogical Society, a copy of which can be found at the San Marcos Public Library (Hays County Historical Collection) and the Texas State Library. 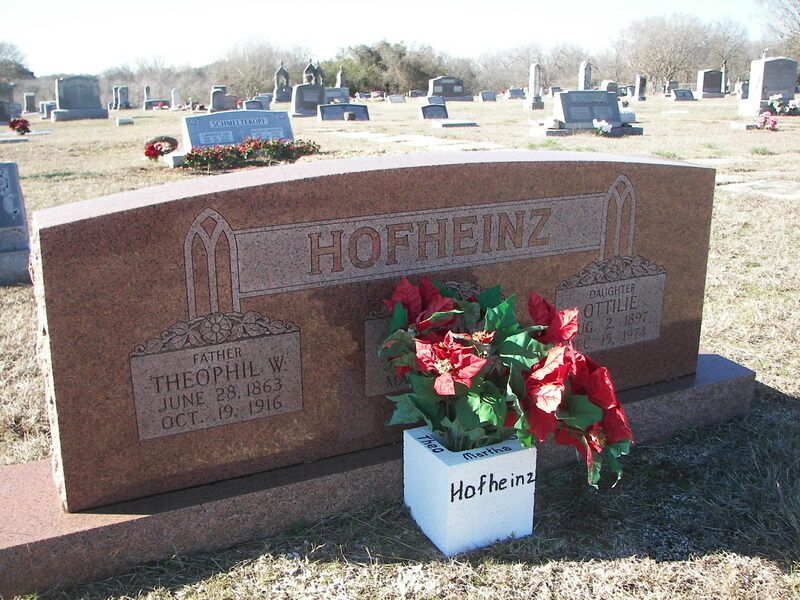 To reach the cemetery from IH 35 near Buda, go west on Main Street to the FIRST set of lights (Old San Antonio Road). Turn RIGHT (north) and follow Old San Antonio Road, toward Austin (est. 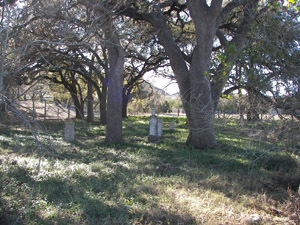 2 miles) to Twin Creeks Road (in Travis Co.) Turn LEFT (west) and go .2 miles; cemetery is on the right. 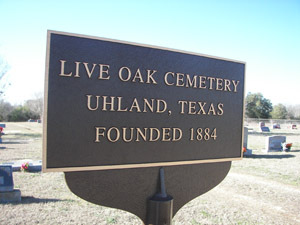 The Live Oak Cemetery, which serves the community of Uhland was founded in the late 1880'5, shortly after Uhland was settled by German immigrants. According to Mr. Albert Nickel, who is a member of the cemetery's association and who takes care of the cemetery, Mr. Gottlieb Schiwitz (1856-1934) gave the land for the original part of the cemetery. 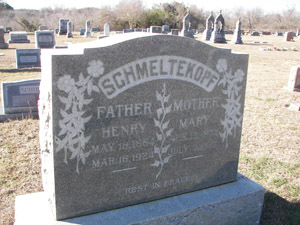 The earliest marked grave is that of Meta Grobowski who died in October of 1890, followed by Karl Kraemer, in 1891. Carl's surname is spelled differently from that of Amalie Kramer who was buried next to him in 1921. The original tract of land encompassed approximately two acres. 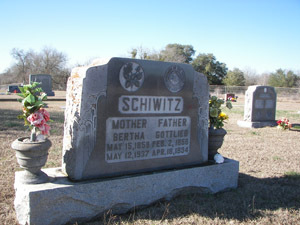 During the 1940's the cemetery was enlarged when land was purchased from either the Heidemann or Schiwitz family. Uhland was originally called Live Oak, thus the name of the cemetery. 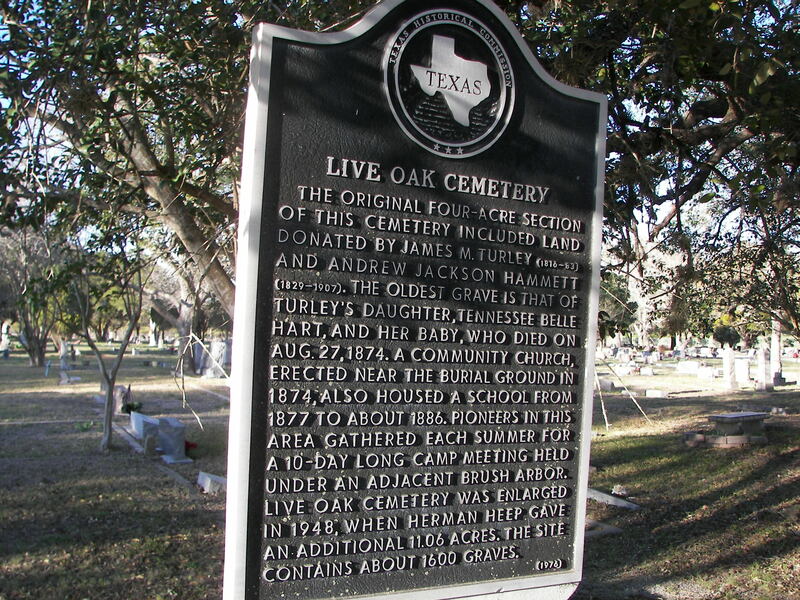 This cemetery is not to be confused with the Live Oak Cemetery near Buda. That cemetery is in Travis County; however, it serves the majority of burials of people from the Buda area of Hays County. There are many interesting stories of people buried in this cemetery -one family almost wiped out by murder; a drowning in the 1890's when a nearby creek flooded and washed away a home with the mother inside it; and many other stories. This cemetery formed a cemetery association a few years ago and developed a perpetual care program. Prior to that time volunteers kept the cemetery clean. It is well kept, clean, and has a chain link fence around it. Its name is over the double entrance gate. 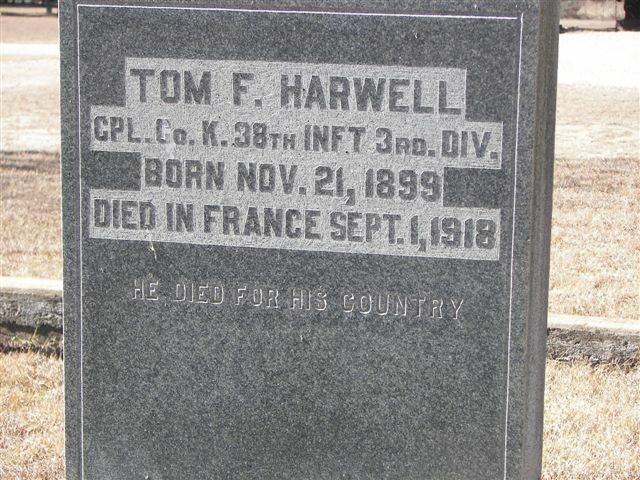 Until twenty or so years ago, Hwy 21 ran next to the cemetery, and it was the dividing line between Caldwell County and Hays County. The cemetery is on the Hays side of that dividing line. 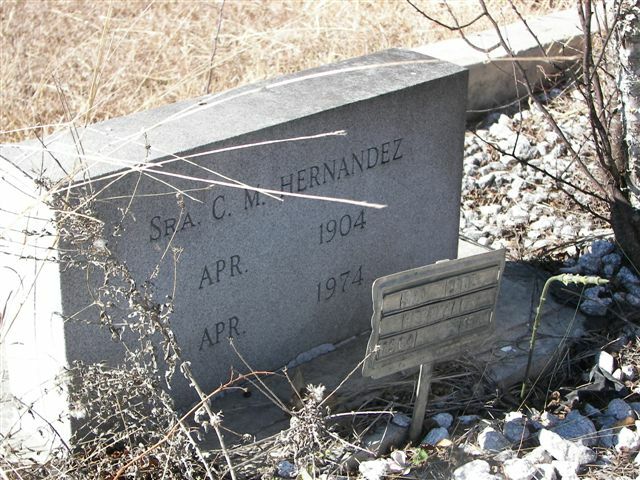 The state moved H~~ 21 about a quarter mile away and now the roadway running adjacent to the cemetery is known as Old Spanish Trail. To reach the cemetery, turn right at Uhland onto Short Street from Hwy 21. Then turn immediately to the right onto Old Spanish Trail. Follow O.S.T. for approximately one mile going through downtown Uhland. The cemetery will be on the right side of the road just before you reach St. Michael's Catholic Church. It is joined on one side, separated by a link fence, by the St. Michael's Catholic Cemetery. We are grateful to Cassia Hodge for helping copy this cemetery and to Albert Nickel for telling us of its history.